The Type IX U-boat was designed by Nazi Germany's Kriegsmarine in 1935 and 1936 as a large ocean-going submarine for sustained operations far from the home support facilities. Type IX boats were briefly used for patrols off the eastern United States in an attempt to disrupt the stream of troops and supplies bound for Europe. It was derived from the Type IA, and appeared in various sub-types. Secondary armament was provided by one 10.5 cm (4.1 in) deck gun with 180 rounds. Anti-aircraft armament differed throughout the war. They had two periscopes in the tower. Types IXA and IXB had an additional periscope in the control room, which was removed in Type IXC and afterward. These long range boats were frequently equipped with Focke-Achgelis Fa 330 rotor kite towed rotary-wing aircraft. DeSchiMAG AG Weser of Bremen built eight Type IXA U-boats. Type IXB was an improved model with an increased range. It was the most successful version overall with each boat averaging a total of over 100,000 GRT sunk. Notable IXB boats included U-123 commanded by Reinhard Hardegen, which opened up the attack in the US waters in early 1942 known as Operation Drumbeat, and U-107 operating off Freetown, Sierra Leone under the command of Günther Hessler, which had the most successful single mission of the war ever with close to 100,000 GRT sunk. DeSchiMAG AG Weser of Bremen built 14 Type IXB U-boats. Type IXC was a further refinement of the class with storage for an additional 43 tonnes of fuel, increasing the boat's range. This series omitted the control room periscope leaving the boats with two tower scopes. As mine-layers they could carry 44 TMA or 66 TMB mines, though U-162 through U-170 and U-505 through U-550 (35 boats), were not fitted for mine operations. The only U-boat sunk in the Gulf of Mexico, U-166, was a Type IXC. 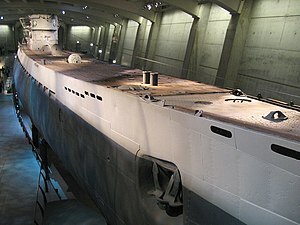 U-505 survives at the Museum of Science and Industry in Chicago, and was completely renovated after being moved in 2004 to a purpose-built indoor berth. DeSchiMAG AG Weser and Seebeckwerft of Bremen, and Deutsche Werft of Hamburg built 54 Type IXC submarines. Type IXC/40 was an improved Type IXC with slightly increased range and surfaced speed. The remains of U-534 are on display at Woodside Ferry Terminal, Birkenhead. DeSchiMAG AG Weser and Seebeckwerft of Bremen, and Deutsche Werft of Hamburg, built 87 of this type. Type IXD was significantly longer and heavier than the IXC/40. It was faster than the IXC but at the cost of slightly reduced range. They had three pairs of Daimler Benz diesels: two pairs for cruise and one for high speed or battery recharge. There were three variants: the IXD1, IXD2 and IXD/42. The IXD1 had unreliable engines and they were later converted for use in surface transport vessels. The IXD2 comprised most of the class and had a range of 23,700 nautical miles (43,900 km; 27,300 mi). The IXD/42, was almost identical but with more engine power (5,400 ehp instead of 4,400). In 1943 and 1944 the torpedo tubes were removed from a number of IXD boats converted for transport use. In their new role they could transport 252 tonnes of cargo. The range was extended to 31,500 nautical miles (58,300 km; 36,200 mi). DeSchiMAG AG Weser of Bremen built 30 Type IXD U-boats. U-883 was launched on 28 April 1944 and commissioned 27 March 1945. Her career ended in Operation Deadlight. U-884 was launched on 17 May 1944 but was badly damaged on 30 March 1945 by US bombs while still in the dockyard. U-885, U-886, U-887 and U-888 were laid down but construction halted on 30 September 1943 when all IXD/42 contracts were cancelled. ^ a b Gröner, Jung & Maass 1991, p. 75. ^ a b c d e Gröner, Jung & Maass 1991, p. 68. ^ "U-505 (German Submarine)". National Historic Landmark summary listing. National Park Service. Archived from the original on 12 February 2012. Retrieved 11 June 2008. ^ "The U-Boat Story - The Story of World War 2 German Submarine U-534". u-boatstory.co.uk. Retrieved 6 February 2010. ^ Gröner, Jung & Maass 1991, p. 114. This page was last edited on 7 March 2019, at 02:00 (UTC).